Protect your home and loved ones from fires by getting early and accurate smoke detection with the 9120LBLA from BRK. This 120VAC wired smoke detector can be used as a single smoke alarm or as part of a much larger network of alarms making it ideal for not only residential applications but for properties like college dorms, hospitals, hotels, motels or other multi-family dwellings. 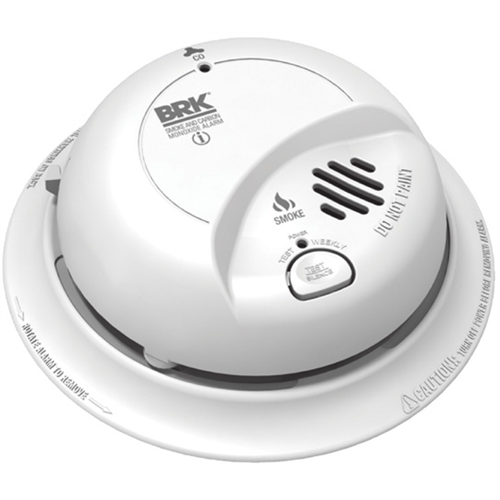 It can be connected with up to 18 other BRK devices, 12 of which can be smoke alarms. The detector features a dual ionization smoke sensing chamber which has a screen placed over it to prevent insects from getting in, an 85dB horn as well as a “silence” feature to help reduce nuisance alarms. When connected with other units, it has a “Latching Alarm Indication” function that’ll be able to specify which of the units went off and triggered the alarm so you can pinpoint where the smoke originated. Its “Perfect Mount” system consists of a gasketless base and a mounting bracket that’ll keep the alarm secure over a wide rotation range, allowing for true alignment. Comes with a 10-year sealed lithium battery back-up in the case of power failure.